How do I record Accommodations and Individual Education Programs (IEPs) for existing students? 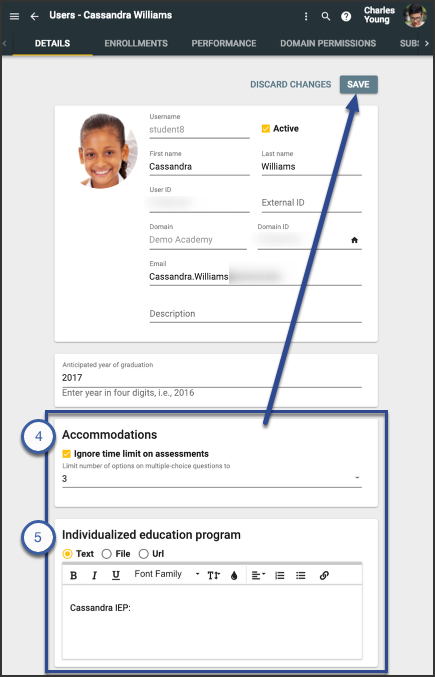 Buzz lets you easily record Accommodations and other information that inform Individual Education Programs (IEPs) and compliance with 504, NCAA, ELL, etc. This content is visible in a read-only form to the users' teachers, but not available to students. Formerly, this kind of content was managed through File Notes; all File Notes have been translated into Accommodations. Check the box if you want to Ignore time limit on assessments for this user. If you want to Limit number of options on multiple-choice questions, select the desired number in the dropdown menu. Use the Individual Education Plan (IEP) rich text editor to record specific notes about the user. Remember that admins can access and edit the notes, and the user's teacher can access a read-only version. In order for an Accommodations (flag) icon to appear for teachers, you must add either a note or attachment using the rich text editor. Checking the Ignore time limit on assessments or Limit number of options on multiple-choice questions boxes without a note or attachment won't display a flag for teachers. Once Accommodations are created for a user (as either a note or attachment in the rich text editor), an Accommodations (flag) icon appears in various places of the Teacher app. 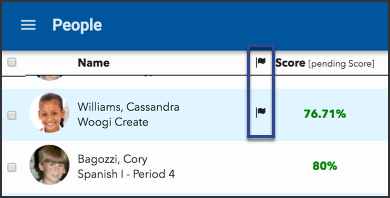 When the column is made visible, an Accommodations (flag) icon appears next to students with Accommodations in the People and Performance tools. 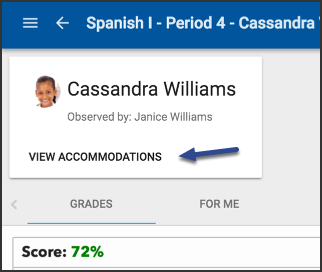 When a teacher selects that student to access their Student screen, View Accommodations appears below the student name. Teachers can click it to access the read-only Accommodations. Great feature! Are there plans to make this available through the Teacher App? The feedback I received is that teachers would like to be able to add and edit these notes from within the course as they are teaching. If we were to create a 'Custom Role', what permissions must be enabled to allow a user to create and edit the 'File Notes'? Also, if that feature is enabled, what else does it allow the user to create/edit? Hey Denny, the role should contain Domains: Read, Users: Read, and Users: Edit. A user granted this role would be able to see domain information (not edit) and will allow them to edit other user information. In addition to the "ignore time limits" option could you also include a way to set a different time. For example, none of my students with IEP's get unlimited time. Most get time-and-a-half. A few may get double-time. So for me, a multiplier like that would be nice to set each student to 1.5*time or 2*time. That way it could apply to all assessments regardless of how much time I allot. That would be easier than manually setting different time limits via groups as I do now. This is good, but from what I understand from our Tech Dept, they can only have admin use this feature since there are other things on that page that you don't want teachers to have access to. Could you put make this particular feature separate from other admin access and make a way for Admin to select certain teachers or staff to enter this information. I would like to see teachers able to access this if the school admin chose to do that. But right now, they cannot do that. Also, is this box visible to parents and students? or is it only seen by school teachers? It is critical to know who can see it! Could the API be updated to allow setting/reading the accommodations text? Yes, Ethan, it could be updated through the API. The path to the file is stored in the User Data under the `personalneedspreferences` node. The attribute name would be `iep` and the file path should be `Teacher/managed/iep.html`. Can you translate your JSON example above to XML, but also include a specific imaginary user id (45126759425) and an imaginary pdf file (walker.pdf) in your example? That would give me a model to imitate when trying to do this. Thanks much! I would love to see the student flagged for an accommodation if either of the boxes is checked. This would help the teacher identify students with accommodations. Thanks! How do I review notes on student Accommodations?